OPENING HOURS - Site de creches-jardin-eveil ! In order to accompany families in their need of care, the nursery welcomes children from 07:00 to 19:00, Monday to Friday. The morning session runs from 07:00 to 13:00, the afternoon session from 13:00 to 19:00. We accept "Chèques Services". 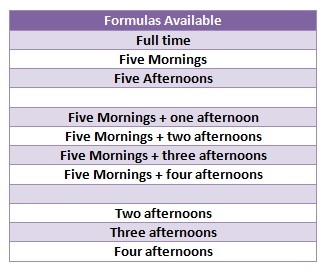 For part-time children, it is possible to have special sessions. The request must be made as soon as possible, only the maximum capacity not reached in the group can give a favorable response to the extraordinary session.